Today, Apple introduced a new search ad product called Search Ads Basic. The existing search ad service, which was introduced a little over a year ago, has been renamed Search Ads Advanced. Search Ads Basic offers fewer of the advanced options and tracking available in Search Ads Advanced and spending is capped at $5,000 per month, but developers only pay for installations generated by their search ads. In contrast, developers pay every time someone taps on an ad under the Search Ads Advanced program, whether or not the tap results in a purchase. To get started, all that is needed is to pick the app to be advertised, set a spending budget, and choose a maximum per-user installation cost, for which Apple provides a suggested maximum based on historical App Store data. 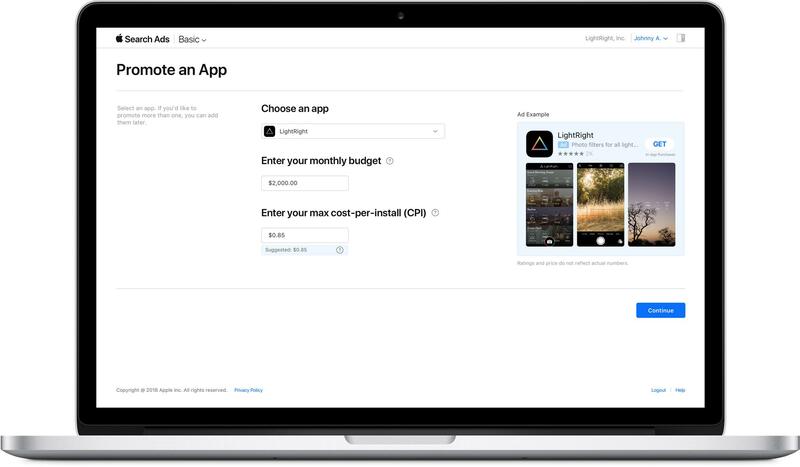 Apple suggested a $1.00 maximum per-install price for Blink, which costs $4.99. Apple is positioning Search Ads Basic as an alternative for developers who don’t have the time to fiddle with the more sophisticated options available with Search Ads Advanced. There is no doubt the process is simple. I set up a campaign for my app Blink in less than a minute. With a $5,000 per month spending limit the new program also seems tailored to smaller developers who may be uncomfortable paying for taps or managing the more complex options of a Search Ads Advanced campaign. Although larger development shops are not precluded from using Basic, the spending limit should discourage larger companies with big advertising budgets. Currently, Search Ads Basic is limited to US App Store, but it will be rolling out to the stores in additional countries later. As it did last year, Apple is sending email messages to developers offering a $100 credit to try Search Ads.